This beautiful 4 bedroom, 4 bath home with private *heated pool and spa is just 4th row from the beach and a short bike ride to the South Beach Marina in Sea Pines making it the perfect location for family vacations! An open floor plan invites you with living and dining room areas that are perfect for families. The kitchen features granite counter tops, stainless steel appliances with access to both the dining and living room. Access to the pool and spa with gas grill is off the dining room. The handsomely decorated master bedroom is located off the dining room and features a king bed and a gorgeous updated private bathroom with a walk-in shower and separate jacuzzi tub. There is a lovely den located off the master bedroom with a queen sofa sleeper. The second bedroom is located off the kitchen and features 2 twin beds, a private bath and views of the pool. The third bedroom features two twin beds with a private bath. The fourth bedroom features a king bed as well as an attached bathroom with hallway access. 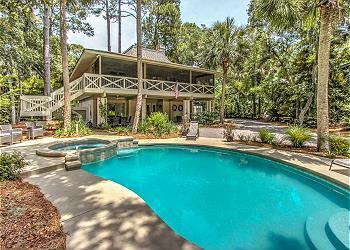 With the space and comforts this house offers you won’t find a better Hilton Head Island home for your vacation!